This male Yellow-headed Blackbird was observed at a small lake near Pinetop, Arizona, Aug. 2009. The habitat is Ponderosa Woodland. Female yellow-headed blackbirds are brownish with usually some dull yellow feathers around the head. 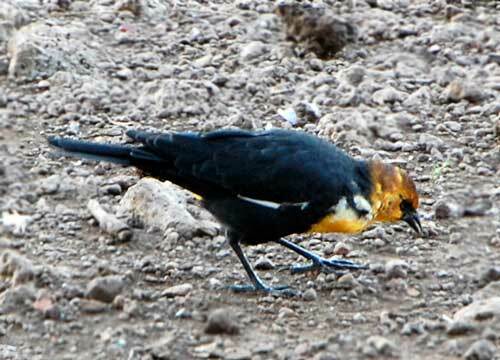 During mid summer yellow-headed blackbirds are uncommon in the Sonoran Desert. By autumn and through winter and spring they are usually a common sight in wetlands, marshes and near cattle feed-lot operations. They are also partial to alfalfa fields when they are being flood-irrigated. Their food includes insects and other invertibrates as well as grains and sprouting seeds.